The Well Court is in the background. 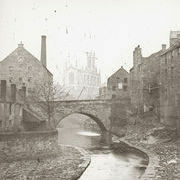 The Wooden Bridge spanning the Water of Leith is out of view left. Photograph taken at the foot of the High Green, Hawthorn. Left to Right - My Cousin Martin Lee aged 7 year's 8 month's, John Hendry aged 7 year's 8 month's, Robert Lee my Brother aged 6 year's. Front middle John Lee aged 3 year's 4 month's my Brother.